Franchise co-owner John Glockner says fresh chicken strips will be added to the menu at the new JL Beers restaurant in Burnsville. But don’t let that throw you. Burgers and beers are the backbone of this business. After opening their first JL Beers last year in northeast Minneapolis, Glockner and his partners are launching a second in the former Carpet King retail building at 1230 County Road 42. It’s near the new Starbucks and Chick-fil-A locations on the site of the old Champps restaurant at 42 and Burnhaven Drive. The location is something of a homecoming for Glockner, who grew up in Burnsville (where his parents still live), lives in Eagan and graduated from St. Thomas Academy in 1982. When the partners learned the Carpet King building would be vacated this summer, they jumped. Renovation of the 4,000-square-foot leased space is underway, and opening is set for the first or second week of November, Glockner said. Glockner, who studied hotel-restaurant management in college, worked 23 years for Patio Town, 15 as vice president, before going into the restaurant business. His partners are Mike Wright, a high school buddy who owns five Famous Dave’s restaurants, and Ted Coulter, who operates them. Wright also co-owns the JL Beers in Sioux Falls, S.D. 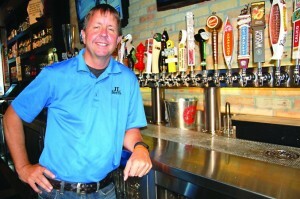 The trio are the first franchise group of JL Beers, founded in 2009 in Fargo, N.D. Other company locations are in Bismarck, Grand Forks and Moorhead, Minn. The burgers, a dozen varieties strong, have garnered positive Twin Cities press since the partners opened in April 2014 at University Avenue Northeast and 1st Avenue Northeast. Beers include regional craft favorites such as Surly and northeast Minneapolis brands Insight, Indeed and 612, Glockner said. A JL Beers phone app informs customers exactly what’s on tap that day. Look for a small selection of more commercial names as well. “We’re not beer snobs, where we look down at people that want to have their Coors Light,” Glockner said. The restaurant will seat about 110, with a 20-seat patio. The Burnsville decor will match the brick interior of the Minneapolis location, Glockner said. Hours are 11 a.m. to midnight. A JL Beers franchisee group has signed a lease at Burnsville’s Burnhill Plaza shopping center. 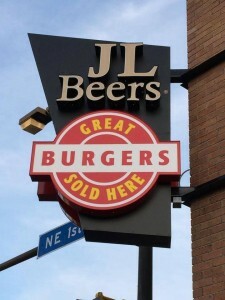 The group owns the JL Beers restaurant that opened in Minneapolis last year, said Justin Wing, senior leasing associate with Minneapolis-based CSM Corp.
Fargo, ND-based JL Beers has 10 locations in North Dakota, South Dakota and Minnesota, and is also planning a new location in St. Cloud. “They have an exciting product and a great atmosphere. We think they will drive a lot of traffic” to Burnhill Plaza, Wing said. The new JL Beers restaurant will go into a freestanding building on the north side of Burnhill Plaza, which is just off County Road 42 and Burnhaven Drive. The current tenant is Carpet King, which will move in late July to a former Radio Shack store in Savage. Construction will begin Aug. 1. The restaurant will open in October of November. The Burnsville restaurant will sit just north of Chick-fil-A and Starbucks stores now under construction. The two will replace an 8,000-square-foot Champps Americana location that was razed this winter after CSM chose not to renew the restaurant’s lease. Wing said the Chick-fil-A and Starbucks will open in September or October.